Unique pest-trapping device draws keen attention at agriculture exhibition. Barrix Agro Sciences participated in the 4th edition United Agritech 2015 exhibition held at Madurai. 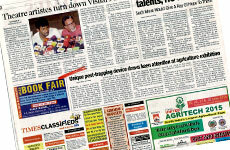 Here, the Times News Network covered the traction gained by the Barrix stall in a print article. The article highlights effectiveness of our Pheromone traps and Sticky sheets, demand of such products from farmers and a testimonial from Tirunelveli Deputy Director of Horticulture, B David Raja Beulah.